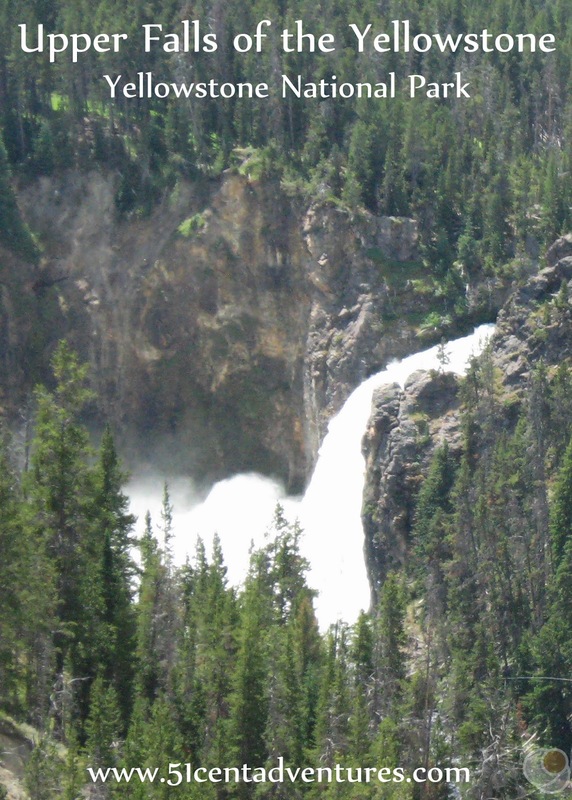 The Upper Falls of the Yellowstone is the first waterfall on the Yellowstone River. The water rushes around a bend and then down 109 feet. A short trail leads to an overlook right on the brink of the falls. 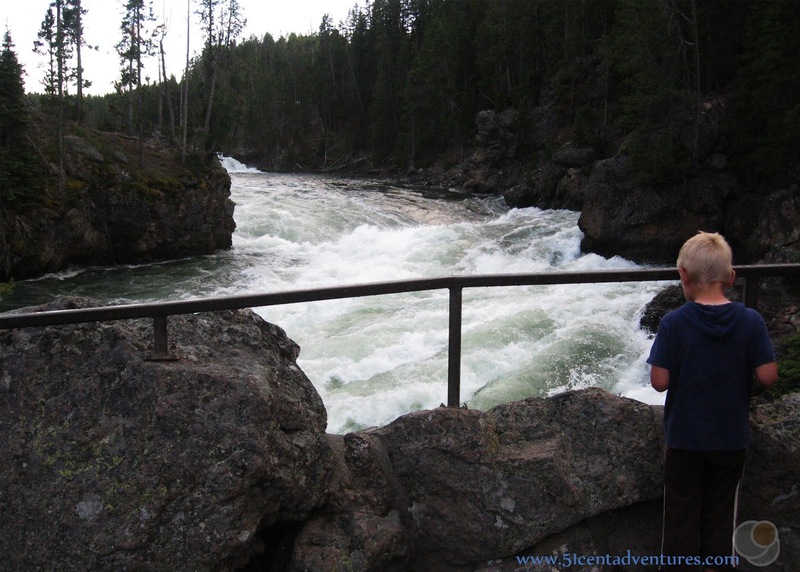 Standing on the edge of the waterfall and watching the water plunge downward is one of the best sights in Yellowstone. Location: The parking lot for Upper Falls is about 1.8 miles south of Canyon Village. Canyon Village is on the eastern side of the park where the upper and lower loops of the Grand Loop Road meet. Hiking Time and Distance: The waterfall is a little over .1 of a mile from the parking lot. Your visit to this waterfall could take as little as 10 minutes. But you'll want to plan to spend time admiring the waterfall. Operating Seasons and Hours: The trail to the waterfall is generally open from Memorial Day weekend through October. 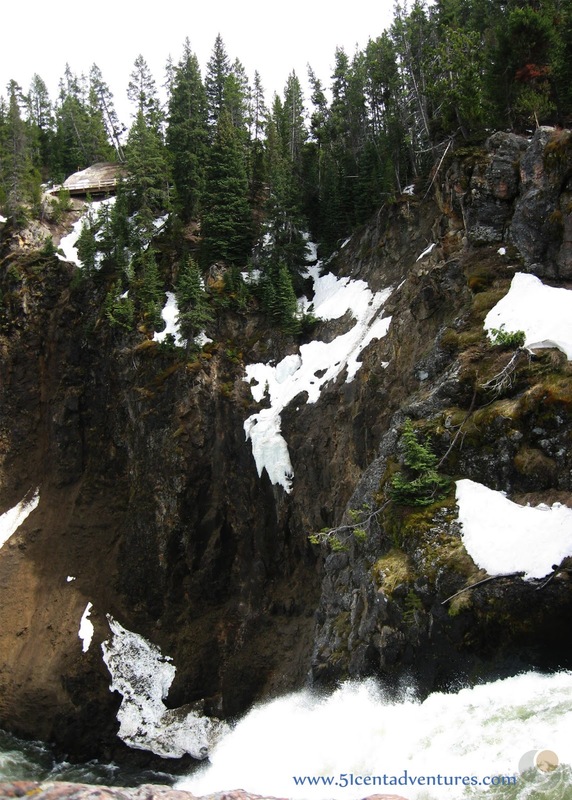 Depending on snow levels you may not be able to reach the waterfall earlier or later in the year. Closure Information: The Brink of Upper Falls area is scheduled to be closed for reconstruction from July of 2018 through the Summer of 2019. The good news is that the viewpoint on the South Rim trail will be open again in July of 2018 so you'll still have a chance to see the falls, just not up close. Date of Visit: Many times throughout the summer of 2017 and several visits in earlier years. In the summer of 2017 I received a job with Xanterra Parks and Resorts in Yellowstone National Park. I moved there with my husband and our four young children. We lived in a 25 foot RV and spent all our free time exploring the park. 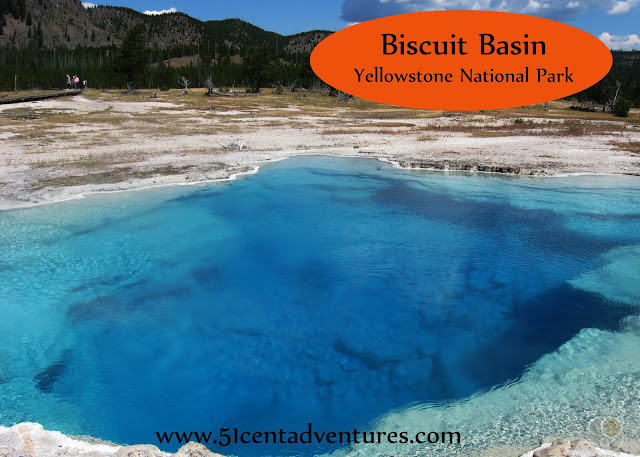 This is the tenth of many posts that I will write about specific features within Yellowstone National Park. At first these aren't going to be in any particular order, but in a few months I'll start grouping them into lists. This one would probably fit into a list such as best waterfalls in the park. If there is one part of Yellowstone that I know better than any other, it's Canyon Village. On each of my four trips to Yellowstone I made sure to stop in the Canyon Village area at least once. During our summer in Yellowstone my family lived in the Canyon Village employee campground. We hiked on a trail in the Canyon area at least once a week. We got to know the area very well and I'm excited share the places we discovered with you. Canyon Village can be divided into four main sections. There's the actual village part with the hotels, campground, dining facilities, visitor center, gift shops and gas station. There is the North Rim of the Canyon, the South Rim of the Canyon. And finally there is the Upper Falls Area. 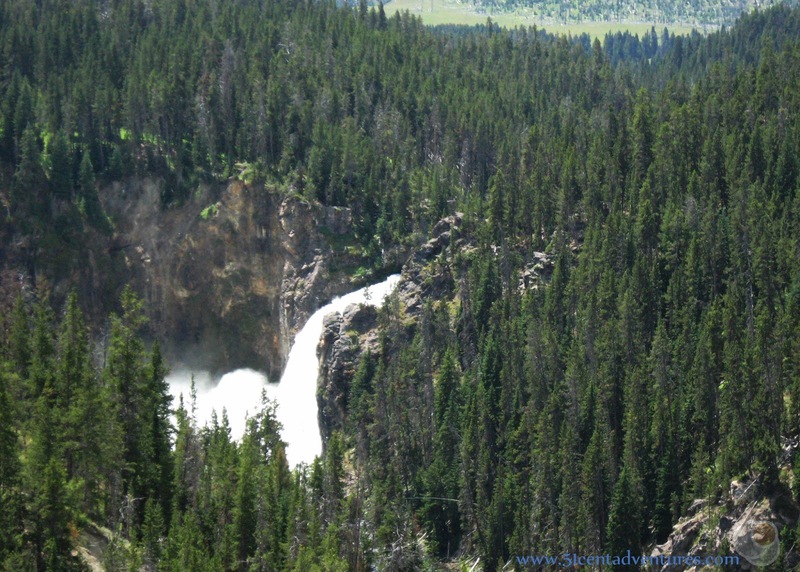 Today we are going to talk about Upper Falls. If you've ever wanted to stand on the edge of a waterfall then Upper Falls is perfect. The trail from the parking lot to the Brink of the Upper Falls is only 1/10th of a mile long. You do have to walk down some stairs so it's not wheelchair or stroller accessible, but other than that you can see this waterfall with very little effort. The first thing you see after you come down the stairs is the mighty Yellowstone River rushing toward you. It hits the rocks and turns to the right. This is a picturesque spot in it's own right. The best part is when the water plunges over a 109 foot cliff. Standing at the overlook and watching the water run over the falls is always one of my favorite things to do in Yellowstone. I was 17 years old when I first stood on this spot. I remember being so impressed by the force of the water. The next time I visited the park was in 2008 when I was 23 and my husband and I were celebrating our 1st wedding anniversary. We came in May and unfortunately the trail was still closed due to snow fall. We made up for that on our next trip to Yellowstone, a quick little two day trip with my sister and her husband in July of 2010. 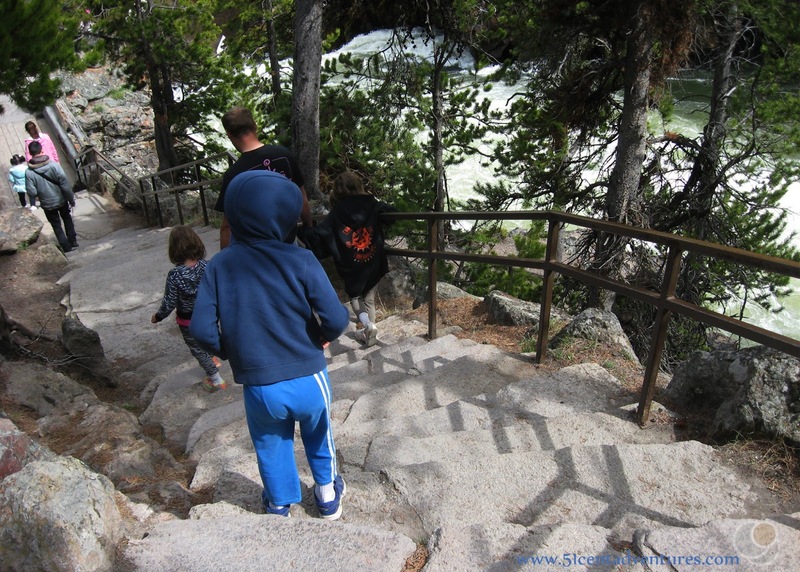 I was about 5 months pregnant with the twins, but that didn't stop me from taking the short walk to Upper Falls. 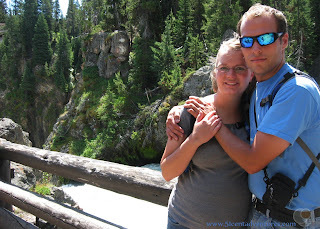 Little did I know how intimately acquainted the twins would be with Yellowstone as children. I returned with all four of my kids six years later in the summer of 2015. I'd driven all the way from Alabama to Utah for a wedding and I figured we should add a trip to Yellowstone to the plan. I reasoned "we don't know when we'll be on this side of the country again and we should see Yellowstone while we have the chance." Oddly enough our next chance came two year later when we lived in the park. Life takes some funny twists and turns. Every time I've seen this waterfall I've marveled at its consistency. Water has been flowing over this cliff for hundereds of year. My life is always a little different every time I see this waterfall, but the waterfall is always the same magnificent sight. Maybe that's why I enjoy the outdoors so much, because nature is a nice constant in a crazy world. If you want to see the falls from a distance there are a couple of places to do that. One place is on the trail to the Brink of the Lower Falls. This view is available during the first 1/4 mile of the hike down to the Lower Falls. In July of 2018 there will be a newly constructed lookout on the South Rim Trail. It will be accessible from the Uncle Tom's parking lot. This whole area was under construction and closed during the summer of 2017 so I was never able to go there. But once its open it should give you a pretty great view of the waterfall from the other side of the canyon. In this picture you can see the new viewing platform under construction in the top left of the picture. Unfortunately, once the South Rim Lookout opens up the Brink of the Upper Falls trail and parking lot will close for trail reconstruction. This area will be closed from July 2018 to the summer of 2019. Recommendation: Everyone should plan to take a few minutes and walk to the Brink of the Upper Falls. This is one of the shortest hikes in the park, and will take you to a breathtaking sight. Directions: The parking lot for Upper Falls is about 1.8 miles south of Canyon Village. There is no direct trail from Canyon Village to Upper Falls so you will need to drive there in your car. Drive south from Canyon Village on the Grand Loop Road. A sign will indicate the road that leads to Upper Falls. From the parking lot you will need to walk 1/10th of a mile to the waterfall. Places Nearby: No visit to the Canyon Village area is complete without a stop to see the Lower Falls. Think of Upper Falls as the warm up act for the main event that is happening down river. 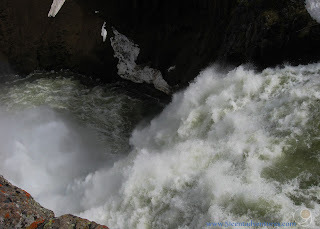 My next few posts will talk about places to view the Lower Falls. First we'll talk about the South Rim. If you are wondering what the differences are between Upper and Lower Falls check out this post.